A life saving operation is all in a day’s work for so many doctors working in hospitals; they think nothing of the lasting impact they may have on that patient’s life as they have a job to do and need to keep their focus on that job. For one patient Ashli Taylor she never forgot the operation that a doctor performed on her when she was a baby which gave her the gift of life. And what she did to honor that memory has moved so many people who have witnessed her actions. The 15 year old was born with congenital cirrhosis of the liver. 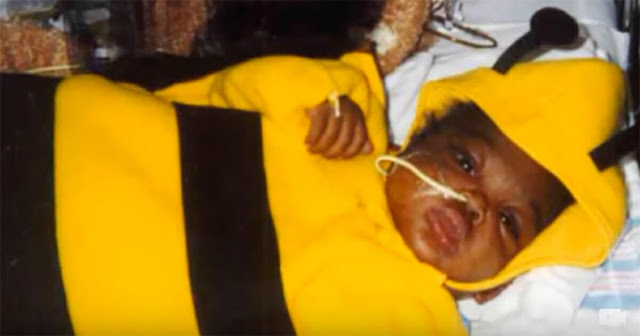 As a baby, she was jaundiced and had to be fed through a nasal tube. The first few months of her life were spent inside hospital rooms with plugs and cords attached to her tiny body. She needed a transplant in order to survive. Ashli’s mother, Crystal Pope-Taylor, donated part of her liver to save her daughter’s life. The transfer was successfully completed at Baylor Scott & White in Dallas, Texas by Dr. Robert Goldstein. Thanks to her selfless mother and the brilliant surgeon, Ashli went on to live a healthy, happy adolescence. Ashli opened up about her ordeal to her fellow freshman students during a creative writing class in December 2015. For one of her assignments in her class, Ashli wrote a letter thanking Dr. Goldstein 15 years after her life-saving surgery, as she never got the chance to speak with him. One day, Ashli was sitting in her theater arts class at Temple High School when a man in hospital scrubs and a ponytail walked into the room holding a bouquet of flowers. What followed was a moving moment that went viral. Watch Ashli’s response in the video below and you will understand why it went viral. It brought tears to my eyes! This beautiful story not only reminds us the importance of being grateful for the gift of life but of the importance of organ donation. Please share to thank all the organ donor and surgeons who are performing miracles every day.